The outdoor pond in your yard will let you observe your goldfish in a natural setting. 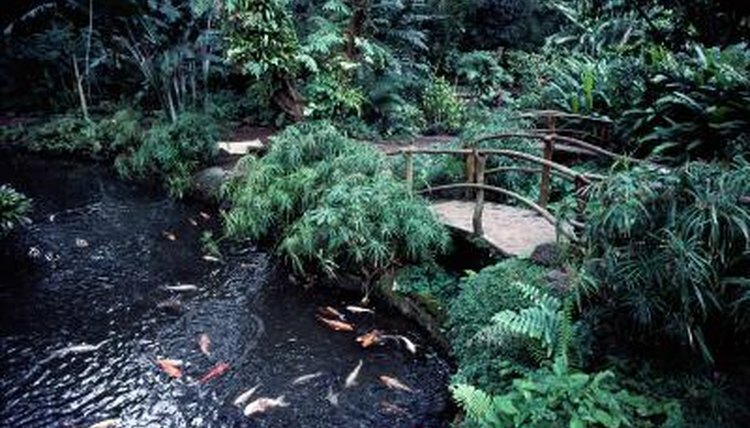 In establishing and maintaining a goldfish pond, be aware that the aquatic habitat needs of goldfish species vary. Some are tolerant of temperature changes, others are not. Also, not all species make good pond mates: Some species do not swim well with others. This slender-bodied fish featuring bright red and crisp white colors is not the most popular selection for outdoor ponds. This native of China grows up to 18 inches -- pretty large for a pond goldfish. Today's pet-store version of the wakin is a descendent of the Chinese gibel carp. He is a friendly fish who quickly begins to surface once he learns regular feeding times. He will overwinter provided you keep a hole allowing for the exchange of oxygen drilled through the ice. This is necessary because the fish does not hibernate. He is a fast swimmer: Best pond mates are shubunkin or comet goldfish. Comet goldfish feature yellow, orange, red or white solid-colored bodies. They are highly hardy: They can survive for 10 to 15 years in outdoor ponds with water temperatures kept between 65 and 78 degrees Fahrenheit. They are a single-tail fish who grow 6 to 10 inches in length. The shubunkin goldfish is a favorite with outdoor pond enthusiasts due to a flexible yet hearty appetite that readily accepts most food sources, with vegetable-based selections being more nutritious choices. This fish features attractive calico-style patterns with mixtures of red, brown, orange and yellow colors combined with black spots. A native of Japan, this fish is an excellent match for most goldfish species other than the telescope and the bubble-eye, who swim at much slower speeds. As indicated by his namesake, the black moor sports black as his only coloring. But that does not mean his appearance is dull. Instead, his scales have a velvety look that glistens in the water -- particularly when sunlight penetrates. His protruding eyes don't offer the best vision. He is best off with other visually challenged species such as the telescope and the bubble-eye. Don't place any sharp-edged decoration in the pond, as these can cut his eyes. The fantail species is an acceptable yet slightly challenging choice for beginners. He is hardy and will tolerate a few missed feedings but not being left for extended periods in cold water. He needs to come inside during the winter in northern climates. This fish grows to 6 to 8 inches and lives up to 10 years. The ryunkin was developed from the fantail and carries over many of his ancestor's tolerant qualities: He isn't a picky eater. He will consume nearly anything offered to him and even things such as aquarium plants that were not intended to be on the menu. These fish will live 10 to 15 years and grow 6 to 8 inches in length. His best pond mates are oranda, fantail or black moor goldfish. He should not be paired with single-tail varieties such as shubunkin or comet goldfish. The oranda offers outdoor pond enthusiasts the best of both worlds: Color variety and a visually appealing body style. His coloration is a plethora of color options from red, black, calico, chocolate, deep blue and a red/white combination on either metallic or matte scales. His body features a hood or fleshy growth at the top of his head. This growth is not fully developed until he reaches 2 years of age. But once matured, the hood is his defining feature. He does not tolerate cold or dirty water conditions, making him a more challenging keeper.